This collection of fantastic stories combine to make a murder and mayhem puzzle fest; with loads of fun trying to solve various murders that really tax the reader's brain. As an example: The first puzzle is called "Barroom Crawl." In this little brain-teaser, a man with a dagger in his back walks into a bar. When the bartender asks what he would like, the man can't speak so he reaches over the bar and plucks an olive and a peel of lemon from the garnishes, hands them to the bartender, and drops dead. The bartender just goes on about his business polishing glasses. The next day it is told, in the paper, that a local businessman had been slain the previous evening. Stabbed in the back he had apparently been able to reach the bar and left some clues with the bartender. The suspects included three associates of the man. Charlotte Barnet, an opera singer from Madrid, on tour performing the title role in Bizet's "Carmen"; Paul Jenkins, a Virginian bookstore owner and expert on the works of Charles Dickens; and, Tom Riley, a used car dealer from California who sold defective cars. The bartender, after reading the article in the paper, knew the murderer's identity immediately. Will you? Now, you can't say that wasn't fun. How about a couple more? In "Party to Murder," Miss February, dressed as Cleopatra for the annual costume ball, is at the Centerfold Mansion and spies a corpse under the bar. Miss October, dressed as Catherine the Great; and, Marie Antoinette, also known as Miss August, chime in with, "Oh Drat! Who is he?" Turns out he was a professor of Greek and Roman history dressed as Socrates. The victim was killed by a poison dart and, on his way down to the floor, he grabbed a photo of Miss October. Hmmm..Is she the killer? Another fun story that is solved for us in the back of the book but, was truly fascinating trying to figure it out. As the author remarks: Who poisoned Socrates? (And don't say the Athenians). And, one more for good measure: In "Rough Calculations," the receptionist was speaking on the phone: "It wasn't my coffee that killed him." She was speaking about an accountant at her firm. "It was one of his clients." Turns out there were three of them; the blackjack dealer, the BMW dealer and the Renoir dealer. The authorities found a calculator under the dead man's desk with the number 4.5825757 keyed into it. Maybe YOU can figure it out! This was a real puzzle. 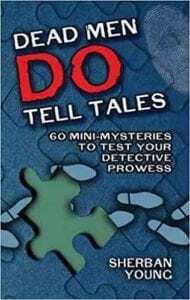 There are 60 of these mysteries to solve and they are not easy but, for mystery readers, it will be a real hoot to see if you can. The author has supplied hints for all the puzzles and also solutions if you need them. This reviewer was able to solve some but, certainly not all. All these clever mysteries will take some effort, in some cases, a LOT of effort, to solve. You will need a knowledge of trivia because the answers run the gamut of literature, art, music, history, sports and many other subjects. The very ingenious author speaks of this book as a "murder-filled crossword puzzle without the squares." The stories are able to be enjoyed alone or in groups of friends. The author says: "They're fun. They're educational and they have dead bodies in them." And he is absolutely right! Quill Says: A fun way to wile away an afternoon by yourself or have a great evening with friends trying to solve these delectable mysteries.